At Franklin & Marshall College, students taking Spanish classes are practicing their language skills outside of the classroom. Through myriad community-based learning courses (CBL), the Department of Spanish connects students with speakers of the language in Lancaster. 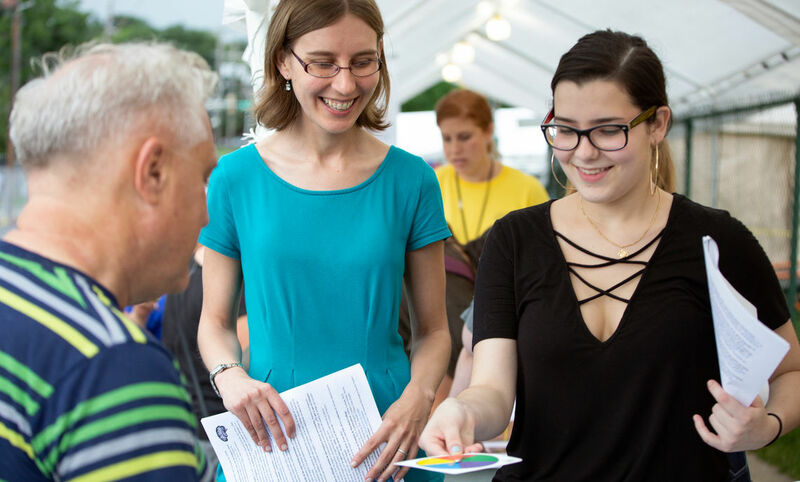 “Research has shown that these practices increase student retention and engagement, and lead to more successful outcomes for students that participate in them,” said Anne Stachura, coordinator of F&M's Spanish community-based learning and outreach. “CBL helps students build oral proficiency and confidence in their proficiency. But I think the most important gains are cultural and interpersonal ones — getting to know the story of an individual human being, their struggles and their goals, which is what you wouldn't get out of just reading a textbook,” said Jessica Cox, assistant professor of Spanish and linguistics. One such example is Cox’s CBL course from last spring, “Spanish in the U.S.” To further explore the social and cultural aspects of this country's Spanish speakers and their language, Cox connected with Dr. Daniel Weber ’76. Weber runs the Latin American Doctors Association and a medical ESL class at the Literacy Council of Lancaster-Lebanon. Cox’s students were matched with members of Weber’s class, many of whom were from Cuba, and tutored them in English through weekly Skype calls. The F&M students learned about their partners' life experiences. Lancaster Newspapers reported that Church World Service, a government-funded resettlement agency, resettled more than 240 Cuban health care professionals in Lancaster County as of November 2017. In addition to Cox’s class, Stachura created other ties between F&M and the local Spanish-speaking community. 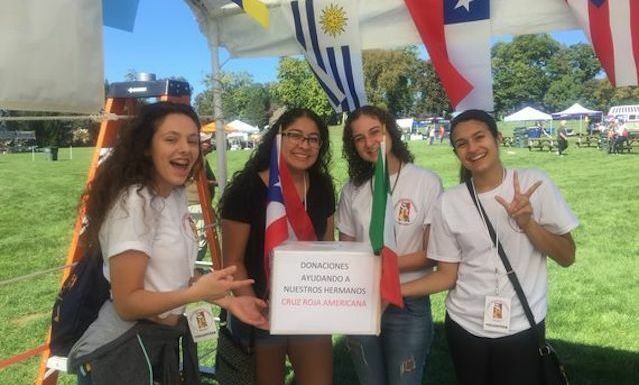 Last year, 16 F&M students volunteered at the annual Festival Latinoamericano in Longs Park, a celebration of music, dance, food, and culture of the Americas in partnership with the Lancaster nonprofit, Latin American Alliance. The organization also sponsors "Señorita Hispanidad," a college scholarship contest in which young women of Hispanic descent from Lancaster County showcase their knowledge of their Latin American country. The 2017 winner, Cuban immigrant Rachel González, spoke with students in Stachura’s Spanish 201 course, many of whom were first-year students. “That section of Spanish 201 included students with recent experiences of immigration themselves. Informed by both the texts we had reviewed in class on Spanish speakers in the United States, as well as their own experiences, students had many questions for Rachel, which led to a discussion with her about being a newcomer to Lancaster. They were able to practice their speaking skills with a native speaker of Spanish and to relate the class content to an individual from an organization who represents this group within our community,” Stachura explained. Stachura also taught "Spanish and Health in the Community," through which students developed materials and created an information booth about heart disease for the Pennsylvania Latino Health Summit. They then collaborated with the Spanish American Civic Association’s Spanish-language public-access cable channel, TeleCentro, speaking with local experts to create television reports about public health topics relevant to the community, like gun violence and juvenile diabetes. The reports aired on TeleCentro. This fall, Stachura will pilot a Spanish 201 CBL course that works with Reach Out and Read, a local nonprofit that helps families develop bilingual libraries for children 5 years old and younger. Student volunteers will apply their language skills to write a Spanish-language children's book. “I am looking forward to working with a new community partner," she said. "Students will have the opportunity to practice all areas of their language skills — reading, speaking, listening, and writing — while supporting the mission of the project." Those interested in the Department of Spanish’s community involvement are invited to subscribe to the newsletter, Comunidad & Cultural Lancaster, sent weekly during the academic year.